5. "We Can Do That?!" 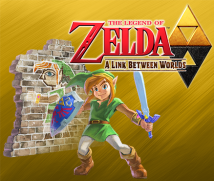 What other challenges arose in making a new Zelda game for Nintendo 3DS? This time, knowing that we could use stereoscopic 3D, we tried putting in ideas making use of height, which we hadn’t tried before. No one had any experience. Right. So we didn’t have any ideas to make us say, “This is it!” Maybe the director should talk about that. Sure! (laughs) In The Legend of Zelda: A Link to the Past, the place with the greatest difference between high and low was the Tower of Hera, and it’s structured so you go up and up. With that tower as a basis, we tried making a 3D dungeon. 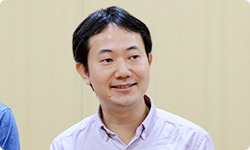 But I was still making Nintendo Land at that time, so Tominaga-san thought over that dungeon for a long time. We wanted to emphasise how tall the tower is, so I thought about making use of 60 fps for something really satisfying, in getting the actions to feel great when you climb further and further up the tower. For example, if you hit a jump platform with the Hammer, you fly to the floor above. Yeah. But we weren’t able to visually express the height by going to an upper floor that way. When you went up stairs, you just entered a closed room. But when you go up a floor this time, the lower levels overlap underneath. You realised you had discovered the true value of stereoscopic 3D. you can go to the tower’s exterior . The one where you go into the wall and then around. Iwata-san, I had you look at the Tower of Hera before E3 201317, and you said, “We can do that? !” (laughs)17. E3 (Electronic Entertainment Expo): A video game trade show held once a year in Los Angeles. The Legend of Zelda: A Link Between Worlds was exhibited for the first time as a playable game in June 2013 at E3. When I heard you say that, I was gratified. I thought, “This will work!” But we made the Tower of Hera long before showing it to you. That’s right. We made it about the end of 2012, and then people began flooding in. In the end, we had an incredible number of people. 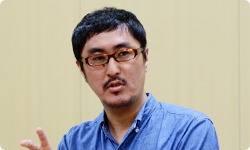 About the time you increased in number, Takahashi-san joined as a designer, right? Yes. I joined soon after Animal Crossing: New Leaf finished. Why did you make Link look like that when he enters walls ? We tried a number of approaches. I don’t think that would have ended up that way unless the team hadn’t really thought over and discussed how to handle those visuals. Yeah. We really hashed that out. When I joined the team, I could sense that Link’s appearance in walls would be a big topic. Until then, it was like in the prototype you showed me earlier. A 3D Link like in Spirit Tracks went into the wall looking the same way, only just in a flat 2D. That’s right. When you’re playing like normal, the top-down viewpoint changes to a side view when he enters the wall, and the conditions are different, so we thought Link’s design should change, too. In an easy-to-comprehend way, you wanted to convey through a different style the conditional changes when Link goes into a wall. That’s right. When phrased as “entering walls,” I got the feeling there was a different world inside the walls. He doesn’t so much enter them as becomes painted on the surface. Right. So I thought it would be good to express it as “becoming a picture” rather than “entering the wall” and have it look like Link was painted on the surface of the wall. a strange artist enemy appear who draws incomprehensible pictures to satisfy himself . Mouri-san was really against that when he saw it. I think that was because I made the early prototype when a 3D Link sticks to the wall and becomes 2D. Although you had made it in just one night, it made Shikata-san say, “That’s it!” So it’s only natural you were attached to it. Yeah. I had a special affection for it. Then Takahashi-san really worried over it. Yeah. I really did. I wasn’t sure how to pull it off. Then I thought he should be a mural like in ancient buildings rather than just a picture, and in the end we reached the current style. When Mouri-san saw Link as a mural, he was convinced right away. Yes. Totally convinced. Becoming a mural fits the atmosphere of The Legend of Zelda. In that way, there was a lot of trial and error until those visuals solidified, but there was also a time when you could do a lot when Link was a mural. But we abandoned that completely. We decided to make becoming a mural only as a means of movement so the players wouldn’t get confused.